Observed on grassland savanna habitat near Nakuru, Kenya. July 2014. Jean-Michel Kersaudy has researched these ants extensively in Kenya and kindly provided the correct name. 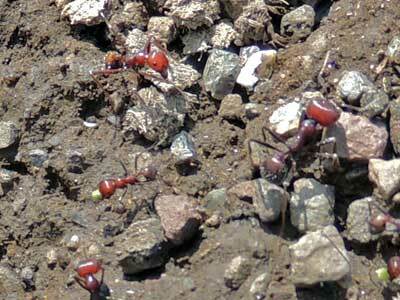 Harvester ants gather seeds and carry them down into the nest below ground for storage in granaries. 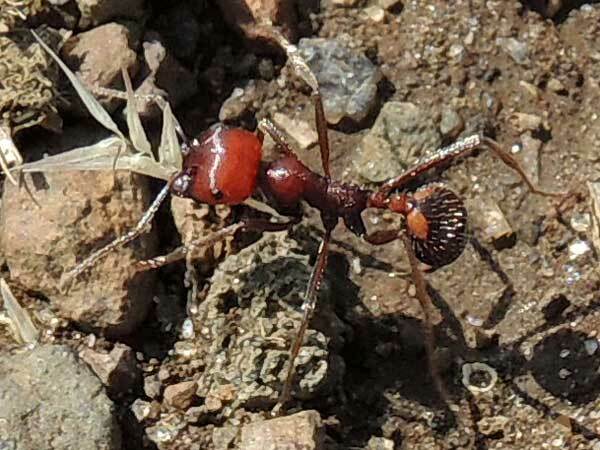 Several species of ants have two or more worker morphologies in the nests. These varied casts each have a different set of roles within the colony. In the first photo above there are three sizes of workers. The smallest workers can efficiently carry empty seed hulls out of the nest and onto a heap of chaff - the pale area in the photo of the nest habit. The very large-headed workers may be the most efficient seed crackers until their sharp mandibles dull. Other casts might be the best soldiers to protect foraging columns or the entrance into the main nest chambers. 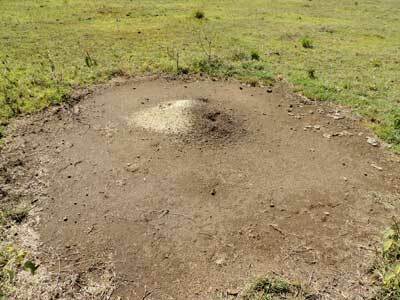 The harvester ant nest shown here was greater than 2 meters in diameter where all vegetation and loose stones have been removed.